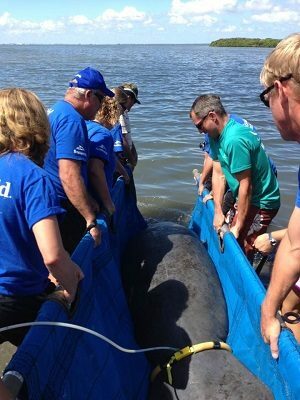 CAPE CANAVERAL, Florida -- Yesterday, the SeaWorld Orlando Animal Rescue Team returned Laces, a nearly 900-pound female manatee, to waters near Cape Canaveral, Florida. Laces was brought to SeaWorld Orlando in August of 2012 after being rescued from the Banana River near Cocoa Beach due to boat strike injuries on her upper back. SeaWorld animal experts have helped more than 22,000 animals in need - ill, injured, orphaned and abandoned - for more than four decades. So far this year, SeaWorld Orlando has rescued 13 manatees and returned eight after yesterday’s return. To learn about all of SeaWorld's conservation efforts visit seaworldcares.com or on Facebook, Twitter and Instagram.